Prefer seeing the sites, cruising the shops and trying out the local restaurants right on your doorstep. If isolation is not your thing but you need to be in the thick of things and don’t want an expensive hotel - try our city centre apartments and homes. Wow. Wow. WOWWWWWWW. Villa 1880 took my breath away the moment I arrived — no mean feat for a seasoned and perhaps super-critical reviewer of luxury villas. What exquisite taste the owners must possess, to have created such an appealing vacation home … and filled it with such covetable furniture and curios. This is surely a dream villa for anyone who appreciates inspiring design. We loved the unique blend of old and new — how the 138-year old plantation house sat so comfortably (and seamlessly) between the contemporary buildings. And I admit swooning over the uber-photogenic interiors filled with achingly chic designer furniture sitting on extraordinary brass inlaid flooring. The media room was fabulously flamboyant with sprawl-inducive sofas covered in pink velvet, a cocktail cabinet …and whatever prompted them to think of a stuffed peacock? Magic was in every detail — for example, our welcome drink was served in a hollowed-out pineapple, complete with bamboo straw, and breakfast included home-made strawberry jam, marmalade, and passion fruit preserve. And how sweet that half of the vanity in the kids’ bunkroom bathroom was set lower so little ones could reach the basin! (Though we were kid-free on our visit, we could imagine them cavorting around in the bunk room with glee). But what made our experience truly special was the staff. 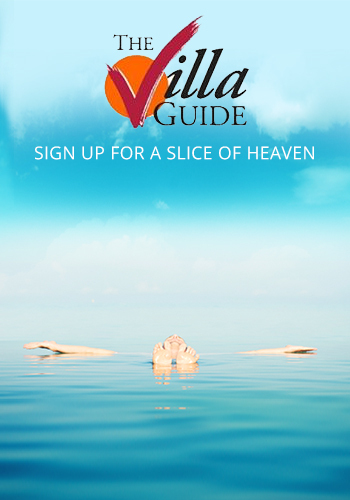 On a tropical island awash with villas boasting well-trained staff, Villa 1880’s raises the bar. Gede the manager was so charming and helpful – and the same went for the butlers we met… even the gardener was chatty. And we cannot enthuse enough about Chef Adi — a rare find, passionate about food and with an inventive mind. The meals we had at Villa 1880 were absolutely superb — oh for another of his home-made panacottas! Ria the spa therapist was also excellent, with a decade working at Shiva Som in the Maldives….whatever you do, don’t leave without having at least one massage with her in the villa’s beautiful spa room. When we first opened the gilded Balinese doors onto Kalimaya II’s garden, we thought we’d come to the wrong place – surely it was too big to be only a two-bedroom villa? 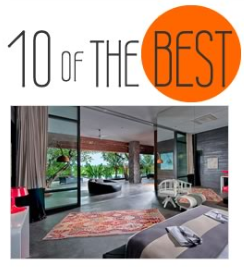 The element of surprise was maintained throughout our visit, as we discovered not one but two living rooms as well as a separate dining room and a second dining area on the upstairs terrace – an extraordinary amount of space, especially in such a hip Seminyak hotspot. This is a really well-designed, well-furnished villa with a lot of extra details to ensure a comfortable, cossetted stay. With the large pool, jacuzzi and infra-red sauna to frolic in (plus four TVs and DVD players), there was plenty to keep us occupied without making use of the complimentary Canggu Club membership. And when we did step beyond the villa walls, we were on the beach or in Seminyak’s best restaurants and boutiques within minutes. This is the perfect place for a couple, two couples or a family of four who want to be sociable and yet still be able to get away from each other. The cook, butlers and housekeepers – all charming and helpful – divide their time between this and the other three Kalimaya villas along the same quiet lane. We considered this a bonus as it means guests benefit from a professional team, but privacy is not compromised by their continued presence – and it means that self-catering is a personal choice, not a prerequisite. We’d done our research and thought we had realistic notions about where we were going, but The Layar surpassed all our expectations. The villas’ design works on so many levels: it’s intriguingly different and totally tropical, but what we hadn’t anticipated was just how ‘at home’ we would feel as soon as we crossed the stepping stones into the gorgeous garden and saw the sweep of roof, from under which the living and dining areas beckoned. The villas are well equipped with satellite channel TVs, sound systems and a good range of kitchen utensils (in the unlikely event that you might chose to self-cater), while bedrooms and bathrooms – all of which are generously sized – are fitted with quality furnishings and adorned with interesting Indonesian art and artefacts. And there’s plenty to keep all ages and interests entertained. The gardens, furnished decks, pools and (in all but the one-bed villas) jacuzzis, coupled with TV areas, lounge and dining spaces will be enough for some, but lazy days can be punctuated with in-villa spa treatments carried out by The Layar’s professional therapists and delicious barbecue dinners cooked in the gardens of your own private oasis. When we did finally tear ourselves away from our new ‘home’ we enjoyed venturing out to explore the shops, restaurants and cafes of Seminyak, all of which were easy to reach on foot. Cocktails on the beach at La Lucciola, followed by an excellent dinner at ‘The Junction’ made a great end to the day. When we first opened the gilded Balinese doors onto Villa Kalimaya III’s garden, we thought we’d come to the wrong place – surely it was too big to be only a three-bedroom villa? The element of surprise was maintained throughout our visit, as we discovered not one but two living rooms as well as a separate dining room and a second dining area on the upstairs terrace – an extraordinary amount of space, especially in such a hip Seminyak hotspot. 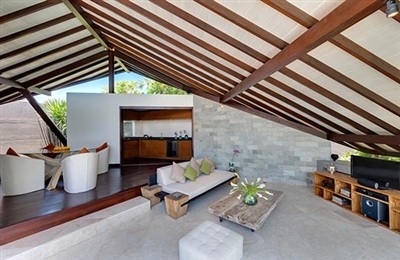 This is a really well designed, well-furnished villa with a lot of extra details to ensure a comfortable, cossetted stay. With the large pool, jacuzzi and infra-red sauna to frolic in (plus four TVs and DVD players), there was plenty to keep us occupied without making use of the complimentary Canggu Club membership. And when we did step beyond the villa walls, we were on the beach or in Seminyak’s best restaurants and boutiques within minutes. This is the perfect place for a couple, three couples or a family of six who want to be sociable and yet still be able to get away from each other. The cook, butlers and housekeepers – all charming and helpful – divide their time between this and the other three Kalimaya villas along the same quiet lane. We considered this a bonus as it means guests benefit from a professional team, but privacy is not compromised by their continued presence – and it means that self-catering is a personal choice, not a prerequisite. And there’s plenty to keep all ages and interests entertained. The gardens, furnished decks and pools, coupled with TV areas, lounge and dining spaces will be enough for some, but lazy days can be punctuated with in-villa spa treatments carried out by The Layar’s professional therapists and delicious barbecue dinners cooked in the gardens of your own private oasis. When we did finally tear ourselves away from our new ‘home’ we enjoyed venturing out to explore the shops, restaurants and cafes of Seminyak, all of which were easy to reach on foot. Cocktails on the beach at La Lucciola, followed by an excellent dinner at ‘The Junction’ made a great end to the day. 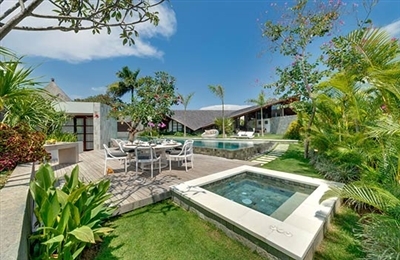 Most villas of this size in Seminyak are self catering. Therefore, a personal butler on call 24/7, plus a menu of delicious food (prepared by a chef in the main service kitchen), is a treat indeed. Villa Toba is very private, and immaculately clean, even though it was built in 2006 it still looks spanking new. The furnishings are all high quality with rattan sofas and gorgeous fabrics and artwork. If you’re into shopping, going to the beach, fine dining and nightlife, this is one of the best locations in Bali; it’s all within walking distance. Another thing we liked about Villa Toba is that it is at the end of a cul-de-sac so there is no sound of passing traffic, and it’s very safe and secure. After a ridiculously early-morning four-hour flight from Thailand we were a bit exhausted when we arrived at Villa Ubud, so how nice was it to find our accommodation so cool, shady and private. Our butler informed us that he was there to cater to our every whim, and just to call him if we needed anything, so after preparing an ice bucket and a couple of champagne flutes (for the duty frees!) he discreetly slipped away leaving us to our own devices. At dinner time he was the perfect professional, adding a noble tinge to our humble but elegantly prepared and presented Balinese feast, but somehow he still kept that casual Bali air, and we loved him for that – the stuff that gratuities were made for. We commented on how perfect the location was for our needs as we ambled down to the beach at sunset for a couple of cold beers. 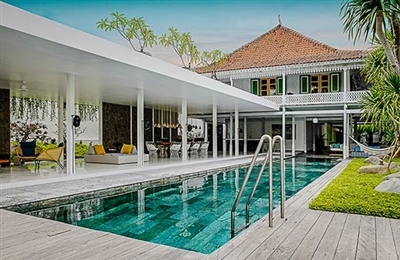 Most villas of this size in Seminyak are self catering, so a personal butler on call 24/7, plus a menu of delicious food (prepared by a chef in the main service kitchen), is a treat indeed. Villa Kawi is very private, and immaculately clean, even though it was built in 2006 it still looks spanking new. The furnishings are all high quality with rattan sofas and gorgeous fabrics and artwork. If you’re into shopping, going to the beach, fine dining and nightlife, this is one of the best locations in Bali; it’s all within walking distance. Another thing we liked about Villa Kawi is that it’s at the end of a cul-de-sac so there’s no sound of passing traffic, and it’s very safe and secure.